iPhone Nano Rumors Resurface: Apple's Answer to Android? Add yet another report to the miniature iPhone bandwagon, which suggests Apple is developing a cheaper, smaller version of its signature smartphone. The newest rumors come courtesy of The Wall Street WSJ, which says the new phone -- codenamed N97 (no, not that N97) -- will be sold to retailers at half the price of the iPhone 4. That means prospective iPhone Nano/iPhone Mini users could get the device for free or almost free with a two-year contract. The WSJ also lights the fire under some older rumors about Mobile Me, iTunes online and a new social networking venture from Apple. With all the rumors circulating about the next round of iPhones it can get a little confusing to keep track of who is saying what. So here's a handy rumor FAQ as the annual iPhone guessing game continues. What might a mini-iPhone look like? 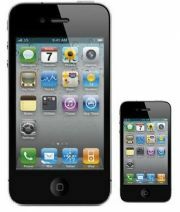 There are now two rumors about the appearance of the hypothetical mini-iPhone. The Wall Street Journal reports the mini-iPhone will be half the size of the iPhone 4, have an edge-to-edge screen, and carry a budget price tag. The WSJ also reports that the mini-iPhone will use what it calls "voice-based navigation" to enter commands -- in other words, it will react to spoken instructions. The current iPhone has limited voice command functionality, but it pales in comparison to the voice commands available to Google Android devices. Previously, Bloomberg said the mini-iPhone will be one-third smaller (not half the size) than the current version, have no home button, and will have a cheap price. Will the mini-iPhone have a FaceTime camera? It's not even clear if a mini-iPhone, whether it's one-third or half the size of the iPhone 4, could run the same apps the iPhone does. As for FaceTime, who knows? But if I had to guess, I would say that a smaller, cheaper iPhone isn't likely to have a FaceTime camera. When will the mini-iPhone debut? Current reports suggest a summer launch, possibly June. This rumor is hardly surprising since Apple typically introduces a new iPhone in June during its annual Worldwide Developers Conference. It's not clear if Apple would launch the rumored mini-iPhone in the United States and other Western countries or if this phone is designed for other regions of the globe. Apple could target a mini-iPhone for consumers in less economically developed nations that cannot afford the higher-priced iPhone. Dell did something similar in late 2009 with its Mini 3 smartphone launched in China and Brazil. Any other rumors about the mini-iPhone? It's not clear if this would affect the mini-iPhone as well, but Bloomberg reported the next iPhone (the so-called iPhone 5) will have a dual-mode chip for GSM and CDMA networks. The news wire also says the next iPhone could have a built-in SIM card instead of a removable one--something that had been previously rumored. What are the rumors about MobileMe? The WSJ says Apple could announce that MobileMe-- the company's online calendar, contacts, mail sync, and file storage service -- will be free to users. Apple currently charges $99 per year for the service. The "MobileMe will be free" rumor popped up in last February and in November, so it's not surprising to see it again. Turning MobileMe into a free service makes a lot of sense since you can already get similar functionality by combining a variety of free services including Google Sync, Dropbox and Flickr. Another old rumor is the notion that iTunes could become an online music storage service that you would use to stream music to your tablet or mobile device. These rumors first started circulating in December 2009 after Apple purchased online streaming service Lala. The WSJ says this feature has actually been planned for more than a year, but Apple was stymied from launching in 2010 due to licensing issues. The newspaper also hints that Apple may make this feature available to current devices only such as the iPhone 4, and leave older iOS gadgets out of the mix. Apple did something similar when it released its "Find my iPhone" feature for free to iPads, iPhones, and iPod Touch devices capable of running iOS 4.2. M-iSpace -- are you serious? I wish I wasn't, but Apple may be getting ready to build some social networking features into its cloud offerings. It's not clear what this feature would look like or what it would do. In March 2010, rumors circulated about a new location-based social network from Apple called iGroups. The idea appeared to be a social network that would allow people attending the same event such as a conference, party or wedding to share files and data. It's not clear if the new social networking rumors, reported by the WSJ, would be similar to earlier rumors. So far, the only social network Apple has produced is Ping, a yawn-inspiring, music-based social network tied to iTunes. Apple's WWDC doesn't take place for at least another four months, but if iPhone and cloud-related rumors keep coming out at this rate, the company's going to have a lot to talk about come June.